Students in Construction Technology finish pieces of rocking horses earlier this month. 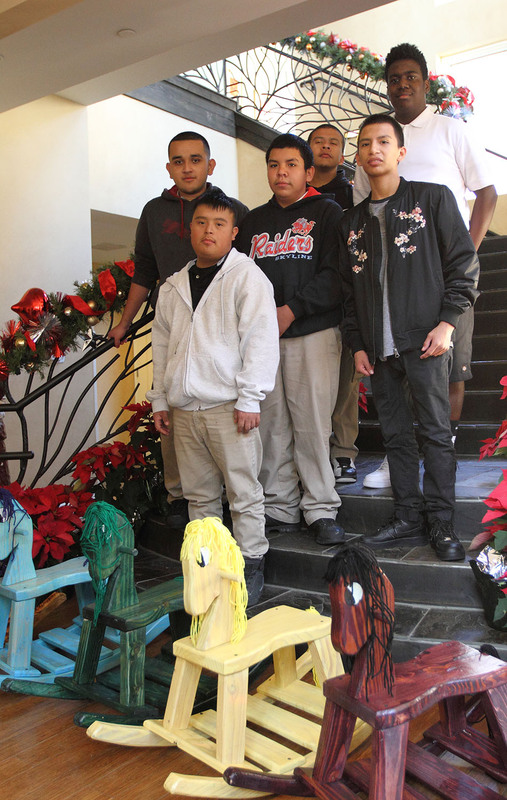 The students deliver about 20 rocking horses to Ronald McDonald House. Colorful wooden rocking horses have been delivered to Ronald McDonald House for the past five years. Students cut, shape, finish and assemble rocking horses each year. Multiple Careers Magnet Center students with Principal Lynn Smith, teacher Terry Stotts and Mary Skinner of Junior League of Dallas. Terry Stotts’ students at Dallas ISD’s Multiple Careers Magnet Center leave his class with much more than woodworking skills. “It’s more than subject matter,” Stotts said. “It’s how to have fun. You can’t learn if you’re not having fun.” With more than 30 years of teaching experience – the last 12 at Multiple Careers – it’s obvious he practices what he teaches in his Construction Technology classes. 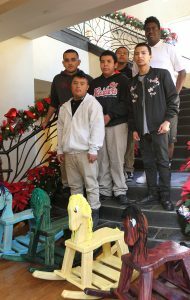 On Tuesday, Dec. 13, Stotts and his students delivered colorful wooden rocking horses they built to the Ronald McDonald House in Dallas, something they have done the past five years before Christmas. Building the rocking horses provide job skills for the students. Amy Hatfield of Ronald McDonald House said the rocking horses are put up for sale in the organization’s holiday shop, where parents with children staying there can shop for gifts. For nearly 50 years, the Multiple Careers Magnet Center has been helping special-needs high school students learn life and job skills to help them find gainful employment and independence. There are currently six career clusters at the school: Building Maintenance Technology; Business Technology; Construction Technology; Culinary Arts; Hospitality & Tourism; and Dry Cleaning and Laundry. The school is in the Carter High School feeder pattern, but teaches students from across the district. 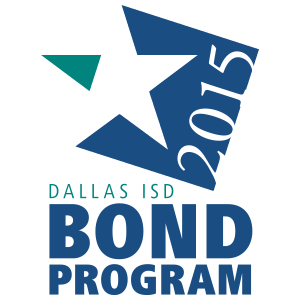 The past three years, Stotts has been awarded an Innovative Teaching Grant from the Junior League of Dallas. The funding covers the cost of materials. Students provide all the labor, from cutting out the pieces, finishing and painting them and then assembling the rocking horses.